Though his journey across South America made him famous, few people recall that Aimé Tschiffely also explored all of England on horseback in the early 1930s. This rare photo depicts Aimé (right) mounted alongside his friend, Don Roberto Cunningham Graham. 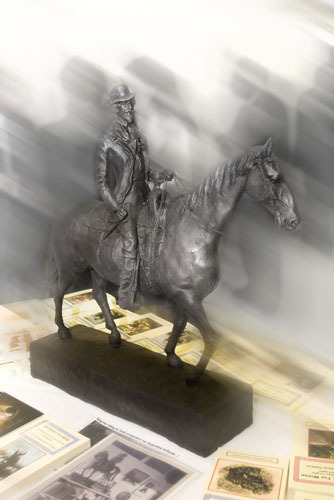 The Scotsman was a devoted horseman who rode in London’s Hyde Park every day. Photo courtesy of Jean, Lady Polwarth. Copyright The Tschiffely Estate and The Long Riders’ Guild. For the remainder of his life, Don Roberto took a keen interest in Aimé Tschiffely’s literary career, watching with pride as the younger man went on to produce nearly two dozen books. The “gaucho laird,” as Don Roberto was affectionately known, not only introduced the bachelor Long Rider to his future wife, Violeta, he also gave away the bride at the ceremony. When in 1936 the elderly Scotsman decided to make a final journey to his adopted homeland of Argentina, Aimé gave him a bag of corn to take to his two beloved horses, Mancha and Gato. Don Roberto fed the horses on Aimé’s behalf, as requested, and died the following day. The republic of Argentina went into mourning at the unexpected passing of her adopted son. A massive outpouring of grief culminated when a tremendous crowd of mourners followed the horse-drawn hearse carrying the departed Scotsman’s body. Leading the crowd in a place of honour were the two Criollo geldings whose adventures had inspired millions of readers. Gato (left) and Mancha had one final mission: to lead the mourners who flooded onto the streets of Buenos Aires in memory of the great horseman, Don Roberto Cunninghame Graham. When Don Roberto died, he left his estate to his nephew, Admiral Sir Angus Cunninghame Graham. Because of naval duties which required him to travel around the world, the admiral asked his uncle’s close friend, Aimé Tschiffely, to oversee Don Roberto’s literary affairs. Now quietly settled in London with Violeta, Aimé not only undertook to protect his patron’s legacy, he penned an important biography of the man whose generosity had changed his own life. Then in 1954, at the age of sixty, Aimé Tschiffely, the man who had out-ridden danger a hundred times, died unexpectedly after a routine surgery in a London hospital. At this point in time Violeta Tschiffely assumed responsibility for her husband’s, and Don Roberto’s, many books. This arrangement lasted until 1975, when Violeta’s advancing age convinced her that she could no longer protect the interests of the departed authors. On the suggestion of Admiral Cunninghame Graham, Violeta passed control of Don Roberto’s literary estate over to Jean, Lady Polwarth, the admiral’s daughter and great-niece of the deceased gaucho laird. Click on either photo to enlarge. During the course of an event-filled childhood, young Jean Cunninghame Graham (right) spent many pleasant hours with both her famous uncle, Don Roberto, and his equally well-known friend, Aimé Tschiffely. These two previously unpublished photographs depict Jean riding Don Roberto’s horse, Chaja. The other photograph depicts Jean’s brother, Robert, being taught to whirl the lasso by Aimé Tschiffely. Photos courtesy of Jean, Lady Polwarth. Then, when Violeta Tschiffely died, Jean Cunninghame Graham, now Lady Polwarth, discovered she had also inherited Aimé’s literary estate. In the Autumn of 2005, Jean Cunninghame Graham announced that she was bequeathing the Tschiffely Literary Estate to Basha O’Reilly, one of the Founding Members of The Long Riders’ Guild and a close friend of Lady Polwarth. Click on photo to enlarge. 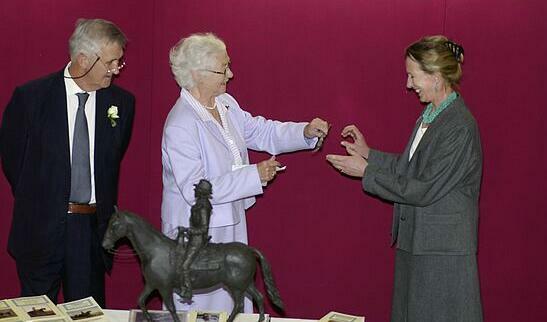 In a ceremony held at Canning House in London, Lord Garel-Jones looks on as Jean Cunninghame Graham (centre) presents Basha O’Reilly with the silver-encrusted riding crop once owned by Don Roberto. At Jean’s request Basha will carry the crop when she joins her husband, CuChullaine, on their forthcoming 25,000 mile equestrian journey around the world. Photo courtesy of Dan Bachmann. Copyright The Long Riders’ Guild. In remembrance of Don Roberto and Aimé, the men whose friendship launched the modern age of equestrian exploration, Lady Polwarth kindly agreed to share her memories of her great-uncle and his saddle-pal with our readers. How long have the Tschiffely and Cunninghame Graham families been associated? My parents, Admiral Sir Angus Cunninghame Graham (Don Roberto’s nephew and heir) and Lady Cunninghame Graham – (Patricia Hanbury) – probably knew Tschiffely as soon as he became my great-uncle’s friend. This means they may have met Aimé when he came to the U.K. in 1932 with his manuscript for Tschiffely’s Ride. We had just come back from three years in South Africa, and were staying with my Hanbury grandparents near London until we found a house. Shortly afterwards, at a soirée given by Louisa Mieville in London, Aimé was introduced by Don Roberto to a beautiful young Argentine opera singer whose stage name was “Violeta Marquesita.” Her real name was Violet Hume, her parents in Buenos Aires being Scots-Argentine, from the distinguished ancient Scots family of Hume. She had been given the main part to sing in John Gay’s West End production of “The Beggar’s Opera.” My parents went to hear her and raved about Violeta’s voice. They probably were taken to meet Aimé and Violeta for supper after the performance by my uncle and his close friends, Toppie Dummett and Louisa Mieville. Violeta (as we always called her) married Aimé in 1933 and was “given away in marriage” by Don Roberto, her own parents still being in Buenos Aires. I was only 6 at the time, so I must have met them later. They may well have all been invited by my Hanbury grandmother to lunch at Hitcham House, while we were still living there. So you see, we really did know them as soon as Aimé married Violeta. After Uncle Robert’s death in 1936 we went to live at the family estate at Ardoch. The Tschiffelys both came to stay frequently. They were real friends to both my parents, as well as to my brother and myself. I can remember Aimé teaching my brother Robert to spin a rope cowboy style in about 1937. So this means that I personally have known Aimé and Violeta for at least 70 years. 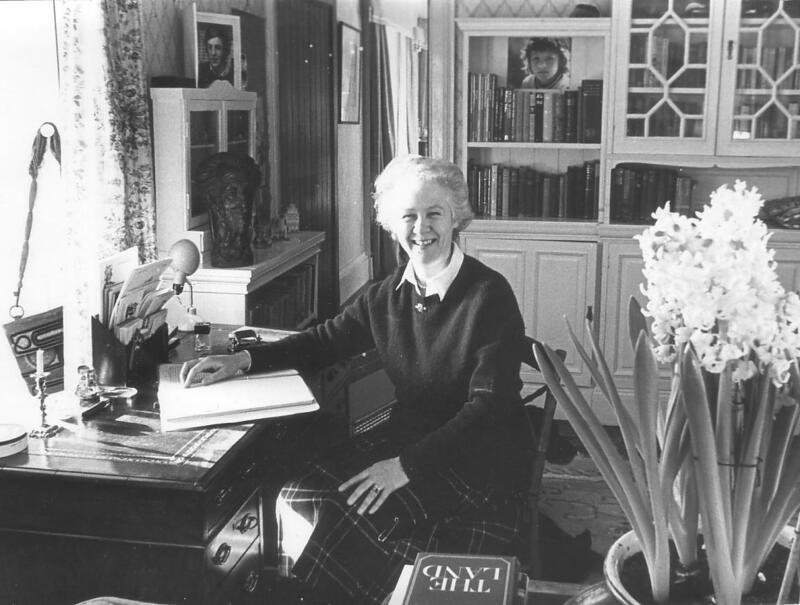 Though she is better known for her work as the Literary Executor of the Tschiffely and Cunninghame Graham estates, Jean, Lady Polwarth is also the author of “Sailor’s Daughter,” a tender reflection of her childhood adventures spent travelling the world with her father, Admiral Sir Angus Cunninghame Graham. Did Aimé share any of his thoughts or stories from “Tschiffely’s Ride” with you? No, I can’t remember ever talking to Aimé about his Long Ride. But in those days horses always came into the conversation. Wherever we went everyone we knew, adults and children, rode. So every pony-loving child in the UK had a copy of Aimé’s popular children’s book, A Tale of Two Horses. I still meet contemporaries who tell me that this juvenile version of his more famous book “Tschiffely’s Ride” was always their favourite book as children. Do you recall anything about Aimé’s death in the English hospital? No, I don’t remember being told that Aimé had died. I was probably busy with my own career in those days teaching. Plus, I was married and had three children to bring up. What can you tell us about Violeta? Did she ever talk to you about Aimé? I used to go to visit Violeta a lot in her little house in Chelsea. We were very fond of each other and loved to talked about all sorts of things. Mainly we seemed to talk about Don Roberto, whom she adored, and not much about Aimé, strangely enough. She always remembered my birthday and sent me a book, though not by Aimé. But we had all those, anyway. Even though she began her career as a singer, didn’t she later work for the BBC during the Second World War? Violeta had a wonderful speaking voice, so she stayed busy till old age, broadcasting in Spanish on the BBC’s World Service. The last time I saw Violeta was when she came to a lecture I gave on Don Roberto at Canning House in the 1970s. Could you tell us how Aimé and Violeta Tschiffely were chosen by your father to take charge of Don Roberto’s estate? As my father was a Naval Officer, and frequently at sea for long periods, he had to decide whom to appoint as “Literary Executor” to my great-uncle’s estate. He decided in 1937 that Aimé and Violeta were the obvious choice. So my father asked Aimé if he would take it over. When Aimé died, Violeta automatically carried on until 1975, when she asked my father if she could retire? He, in turn, appointed me to take charge of my great-uncle’s literary estate. So it was always really “the property and inheritance” of the Cunninghame Graham family, devolved on to the Tschiffelys during their lifetime. When Violeta died (at a great age, in a nursing-home) we found she had “repaid the compliment” and left Aimé’s literary inheritance to me! You’ve guarded Aimé’s estate for how long? I have now worked hard on both Don Roberto’s and Aimé’s Literary Executorships for 30 years! Did your father pass on any special instructions to you regarding the special duty of being Aimé’s literary executor? Over the course of the years, have you been aware of Aimé’s long-lasting historical impact on the equestrian travel world? Yes, of course! Aimé was the first historic Long Rider of the 20th Century known by everyone and riders continue to be inspired by him to this day. You have children and grandchildren of your own, so why choose Basha to protect Aimé’s legend? The Tschiffelys would be delighted that I have passed it on to Basha, as they would have loved her action and enthusiasm! Not only is she a Swiss Long Rider, Basha is immensely capable, intelligent and practical! Plus, none of my children are really interested as they don’t have enough time. Q.E.D. Is it important to protect Aimé’s mounted legacy and the integrity of his literary work? Absolutely. Aimé’s books should remain in print forever, and a film about his Long Ride must be made, please! If you could have made a Long Ride, where would you have gone? The Atlas Mountains in Morocco would have been my first choice. My husband Harry, Lord Polwarth, made an extended equestrian journey there. He travelled in the hoofprints of Uncle Don Roberto, whose adventures are recounted in Mogreb-El-Acksa. The equestrian writings of Don Roberto and Aimé Tschiffely are featured highlights of The Long Riders’ Guild Literary Collection. This international compilation consists of more than one hundred equestrian travel titles available in five languages. In July, 2005 The Guild presented the equestrian travel books in our collection which deal with Iberian and Latin-American journeys to Canning House. Overseeing the presentation was this statue of Don Roberto Cunninghame Graham. The original is owned by his Don Roberto’s great-niece, Jean Cunninghame Graham. This copy was presented to Canning House by the most famous Long Rider of the 20th Century, Aimé Tschiffely. All information and images on this website copyright (c) 2008-2017 The Aimé Tschiffely Literary Estate, Basha O'Reilly, Executor. Click on picture to visit The Long Riders' Guild website.